Nitrate leaching from vegetable production along the Central Coast is under greater scrutiny and is the subject of proposed regulations by the Regional Water Quality Control Board (RWQCB). The regulations as written have stipulated that leachate from agricultural lands should not exceed the public health limits for nitrate in drinking water of 10 ppm nitrate-nitrogen. To date there has been little information developed on the quantities of nitrate contained in leachate from lettuce production. 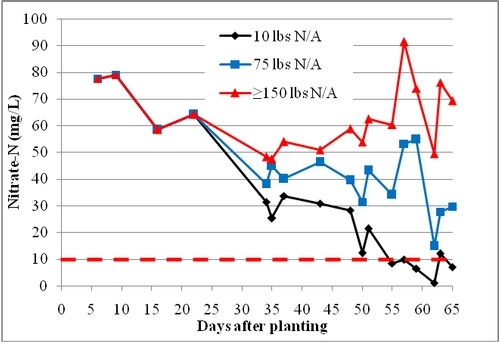 In 2009 we conducted a nitrogen fertilizer trial in which we applied 10, 75, 150, 225 and 300 lbs of N/A and water was applied at 116% of evapotranspiration. 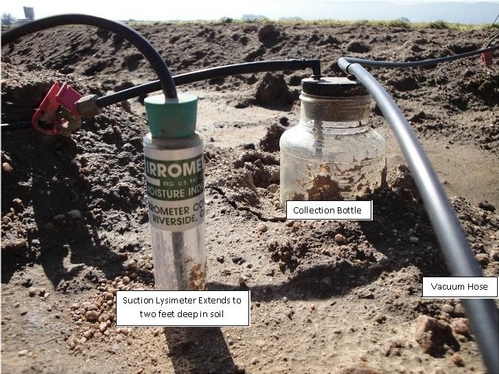 In order to measure leachate from the plots, suction lysimeters were installed to a depth of 2 feet deep in the soil (photo 1). During each irrigation, suction in the lysimeters was maintained at 20-25 centibars which was assumed to be the leachable fraction of soil water. After each irrigation, leachate was collected and analyzed for nitrate concentration. The 10 lbs N/A was a low N treatment (and yielded substantially lower than other treatments), but even in this treatment had leachate nitrate-N concentrations substantially greater than the 10 ppm nitrate-N drinking water standard (see graph below) for the majority of the early season. The concentration of nitrate-N in this treatment declined to below the drinking water standard for the final third of the growing season. These data give us a glimpse into nitrate levels of leachate from vegetable production fields. Even treatments with little applied N can have substantial quantities of nitrate in the leachate. This indicates that monitoring of the concentration of nitrate in the leachate may not be a consistently useful tool for understanding the quantity of N leached.